Historically, autism has been studied from the perspectives of biological and behavioral sciences, leaving many questions yet unanswered. Today, the way an autistic individual perceives the world is of significant interest to researchers, for neurological differences have been found to impact the autistic individual’s perception and information-processing tremendously (Minshew & Williams, 2014, p. 63-73). Because Jung’s typology frames investigation of the psyche in terms of such mental processes, it can provide a new perspective on this very complex condition. The experience of Temple Grandin demonstrates that typological individuation is the key to overcoming the challenges of autism, just as it is for the non-autistic population. Temple Grandin—a gifted scientist, educator, and advocate for the autism population—is herself diagnosed with autism. The struggles pertaining to her condition as she describes them in her books, and which are portrayed in the movie Temple Grandin, provide empirical evidence for the predominance of some functions in her personality. An application of Jung’s typology and Beebe’s eight-function model to Grandin’s descriptions suggests that she is an introverted sensing (Si) dominant individual. Studying a high functioning autistic individual’s typological development could provide new insights into the autism condition. Hyper- and hypo-arousal, that is, over- and under-excitation of the nervous system, is a primary factor contributing to the distinct ways individuals with autism experience sensory input (Grandin, 1995, P. 60). This symptom relates to introverted sensation (Si), which monitors our internal bodily processes. Grandin (1995) herself describes her preferred mode of consciousness as “sensory-based thinking” (p. 30), suggesting the ISTJ type. 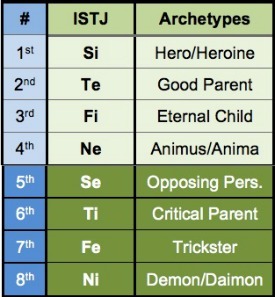 Her heroic or dominant Si is aided by the auxiliary extraverted thinking (Te) function—a parenting archetype and evaluating function—which complements the dominant sensory orientation (Beebe, 2005). It may be that dominant introverted sensing types’ experience of hyper-arousal correlates with this hallmark of autism. And it also appears that the peculiar tendencies of Grandin’s preferred function of Si are exacerbated by the inferiority of her fourth function extraverted intuition (Ne). This could explain some characteristics that are considered unusual for people in the autistic spectrum. This inquiry into the personality profile of an autistic individual is only an initial attempt to understand the complexity of the autism phenomenon in general. A typological analysis of the life of a high-functioning representative on the autism spectrum shows at the least that it is possible for such an individual to set the development of her personality onto a successful track by learning to navigate through the less-preferred functions of her personality. Elsewhere she claimed: “My mind works like Google Images” (Grandin, 2007). Oliver Sacks, a renowned author and neurologist, in his forward to Grandin’s book recognizes the autistic individual’s mind as “a quite other sort of mind” (p. xviii), that is, a mode of perception that is alien to the general, “typical” society. The irrational functions, both sensation and intuition, “merely apprehend what is already given to us by the outer or inner world,” as opposed to the rational functions which “interpret experience” (Beebe, 2006, p. 131). Sensation is the function that “registers reality as real” in that it “delivers to us the sensation that something is” [original italics] (Beebe, 2006, p. 132). Throughout the film, director Mick Jackson captures numerous instances where Grandin orients herself in her surroundings and shows how she associates any new object with an image in her mind, hence registering the new moment in an existing category and/or using an existing category to orient herself around the new object or situation. The director captures these moments by freezing the motion at a particular image for a millisecond in black and white, a clever way to reference a moment being stored in memory. For example, when her mother comes after her, Temple resists the idea of college and asks to stay at her aunt’s cattle ranch. But her aunt’s husband says, “Temple, you should go! It’s a miracle” [that she had got admitted], and she immediately associates the word miracle with an image of a deity emanating light, an image that was used to teach her the concept of miracle when she was a child. Temple cheers up and agrees to go, for the feeling of “having been somewhere before or experienced something similar generally provides a sense of satisfying competency” (McAlpine, Shumate, Evers, & Hughey, 2009), to individuals with dominant Si, especially those on the autism spectrum. When her aunt introduces her to the employees of the ranch, Temple’s mind is portrayed as what Emma Jung, an Si dominant herself, described as a “highly sensitized photographic plate” (cited by von Franz, 2013, p. 39) whereby she scans the men’s hair, clothing, accessories. When her eyes land on the leather belt on one of them, she shouts excitedly: “Are you a cowboy?” and only then introduces herself. Jung wrote, “The introvert is distinguished by his self-assertion vis á vis the object. … He repels all its influences, and even fears it” (cited in Beebe, 2006, p. 133). Grandin (1995/2006) describes her experience of introversion as an “intense fear … due to a neurological defect that sensitizes the nervous system to stimuli that are minor to normal people” (p. 169). She proposes that this could be related to an old “antipredator instinct that has surfaced,” as through her animal research she found similarities between her own sensory system and that of cattle. In the movie, she avoids her aunt’s hugs in much the same way that she avoids the sliding doors of the university cafeteria. She associates the movement of the door with a guillotine and is from then on afraid to approach the doors, thereby demonstrating what Jung (1971) wrote of Si personalities: “Whereas the extraverted sensation type is guided by the intensity of objective influences, the introverted type is guided by the intensity of the subjective sensation excited by the objective stimulus [my italics]” (CW 6, para. 650). And because this function-attitude “may consistently use internal truths to verify information received from the outer world” (McAlpine et al., 2009), she is unable, at first, to locate the inner reference, or rather does so through her superior Si, a process which requires time. Her inability to function in accordance with objective stimuli points to her “infantile” inferior function, extraverted intuition. Not being able to visually discern the possibility of passing through the doors without harm, her undeveloped intuition is incapable of even envisioning that possibility. This is, most likely, due to the ego-dystonic counterpart of the inferior function in her typology, introverted intuition (Ni). Falling in the eighth position for ISTJs, Ni is accompanied by demonic energy which “operates in the shadow to undermine oneself” and renders “miscalculations” in an attempt to “test the integrity of the inferior function” (Beebe, 2004, p. 109). The inferior function remains more conscious but according to von Franz (2013) when in its negative pole, it has a barbaric nature, in that “it can cause a state of possession” (p. 73). Correspondingly, we can propose that her inferior Ne function is possessed by its shadow, the demonic Ni, and therefore, her superior Si jumps in with its sensory library, shouting warnings that prompt her to run away in anguish. We can only imagine what really goes on under Grandin’s skin—or that of anyone with such exquisite sensory perception—and the level of stress caused by sensory stimuli on a regular basis in almost all environmental conditions. Hyperarousal, that is, over-excitation of the nervous system, is a primary factor contributing to the distinct ways individuals with autism experience sensory input (Grandin, 1995, P. 60), and this symptom also relates to introverted sensation which monitors our internal bodily processes. The tendency to crave tactile pressure is very common among individuals carrying a diagnosis of autism. The pressure creates a calming effect, for, as Grandin says, it “calms my anxiety and helps me to unwind” (p. 60). Sensory integration issues produce sensory discomfort, which individuals with autism seek to balance by engaging in various behaviors that relieve the discomfort (Dunn, 2014, pp. 137-138). During her vacation at her aunt’s ranch, Temple observed the livestock handling procedures, which became paramount to her later development. She invented a squeezing machine, a device used to hold the cow still to receive its inoculations. The device calms cattle by simulating the sensation of being in the security of a herd, and her invention similarly helped her navigate the social anxiety of her university years. Grandin claims that the process of “forming concepts and conceptual thought” is a difficult one for individuals with autism, for it requires coherent collaboration among brain regions responsible for different kinds of activities, such as thinking, emotional regulation, etc. (Frith, 1989/2003; Baron-Cohen & Bolton, 1993; Grandin, 1995/2006; Huebner & Lane, 2001). The frontal cortex, which controls the “executive function” is responsible for coordinating this collaboration. This region demonstrates abnormal activity in studies of autistic brains, suggesting unique neurological wiring in autism. Therefore, the integration of various functions, that is the process of conceptualizing, is a difficult task for people on the autism spectrum (Grandin, 1995/2006, p. 30). Her strong superior introverted sensing operation comes to the rescue with its natural call to record sophisticated detail and store it in the photographic library for future orientation in reference. Translated into the language of personality types, one could say that she is “referencing an internal database that is filled with an enormous amount of detail” (Haas & Hunziker, 2011, p. 45). In type terms, Grandin is most likely describing the other irrational function, intuition: her inferior function. Jung (1971) wrote that Ne is “an activity that seizes and shapes its object, … an active, creative process” by which it “transmits images or perceptions of relations between things” [my italics] (CW 6, para. 610). Consequently, conceptualizing implies the activity of this function as it renders a substantial flow of ideas and possibilities. Her tertiary introverted feeling function (Fi) is involved in the process as well, for categorizing implies the function of attributing value to the object. But because the two quasi-conscious functions of feeling and intuiting are blocked from adequate expression in Grandin’s psyche, the superior and auxiliary functions substitute for them “out of a need to satisfy or defend against the type demands of the environment” (Beebe, 2004, p. 105). Her auxiliary extraverted thinking (Te) function operates by identifying “definitions that would hold true for everyone, according to ideas everyone might agree with” (p. 96), hence, the relevance of the “nose of the dog.” “Extraverted thinking is conditioned” by the “objective data transmitted by sense-perception,” for when making judgments—its primary activity—Te leans heavily on objective criteria presented by the external conditions (Jung, 1971,CW 6, para. 577) as presented by Temple in her preferred way of categorizing dogs. Te “strives to rid itself of subjective influences” (para. 596]) as opposed to Fi, which otherwise, would be able to attribute a universal, that is, archetypal value to the animal had her tertiary puella function-attitude (Fi) been assimilated enough to function in service of the superior Si. Clearly, then, the development of her feeling function is co-dependent with the development of the inferior Ne. The inferior function serves as a “bridge to the unconscious” and so its nature is to guide the superior function into the “symbolic meaning of the unconscious” (von Franz, 2013, p. 16). When experienced by a dominant introvert, the inferior function has an extraverted attitude and is “unable to exert conscious control, … is unable to put a brake on, stop” (p. 73). If, in general, extraverted intuition is “oriented by the object” and strives “to discover what possibilities the objective situation holds in store” (1971, CW 6, para. 613), in the case of Grandin (and most individuals with autism), changes to routine, which otherwise would connote a new possibility, usually are a source of frustration and can trigger panic. This, too is descriptive of the barbaric possession of the inferior Ne by its opposite attitude function, demonic Ni. Von Franz (2013) described inferior extraverted intuition as a function “concerned with the impersonal, collective outer world. … The intuition of this type is concerned with events that go on in the background; he picks up possibilities and the future of outer surroundings” (p. 40). As Temple witnesses the cow’s struggle in anticipation of being vaccinated, she herself becomes emotionally involved due to the sensory stimuli produced by what’s witnessed. As she experiences the sensory overload, something important happens, a turning point in the movie and in her life, for she witnesses an immediate change in the cow’s behavior the moment the metal device “hugs” her. The cow immediately calms down, which Temple observes in its breathing—possibly the only concrete, sensory datum available to register what has happened. Temple is awed by the fact that the metal device, when squeezing the animal, calms its agitation so effectively. At this point there are no visual, photographic scenes made by the director to convey to the spectator Temple’s sensory perception. This moment appears as pure intuitive “hunch” (Jung, 1971). Temple’s intuition guided by the objective cow reaches her consciousness through the cow’s feeling, for the cow, now, is feeling calm and relaxed. This appears to be the working of Grandin’s seventh function, Trickster-oriented extraverted feeling (Fe), which provoked her to become worried and curious about what is going on in the chaotic scene, mirroring the negative sensory stimulation. And because Temple stayed with the experience and didn’t escape the sensory overload, she was finally able to get in touch with her own third function, Fi, as she experienced internal harmony, recognizing the feeling of calmness experienced and presented by the cow. This scene sets the stage for Temple’s further development of her underdeveloped tertiary (Fi) and inferior (Ne) functions. She is now learning to use her feeling function in that she is learning what is important to herself and is fighting for it, in order to enable her Ne to function as a mediator of other unconscious possibilities, allowing them to emerge into her life. One incident in the film shows this transformation. The door to Temple’s bedroom in her aunt’s house now has a note with her name on it, a signifier that this is her room. This is the result of a negotiation with her aunt to ensure that there is concrete, sensory-based evidence and hence a logical (Te) explanation as to why that room is hers (i.e., “the door has my name, hence it is my room, and it is my room because it has my name on it”). In the scene, Temple’s aunt is in her room hanging a new curtain when her husband calls her and she leaves the room in a hurry. Because of the wind from the open window, the door swings shut and the note falls on the floor. Temple arrives, walking towards her door, notices the note on the floor, and immediately tears up. Upset, she enters her room and sees that the fan is on and that there is a new curtain. Von Franz said of the inferior function, “There one has to succumb; one has to suffer defeat in order to develop further” (p. 73). So Temple must experience this defeat via a severe emotional breakdown triggered by the note on the floor. Her inferior Ne awakens but limits the possible reasons for the note on the floor to one: that room no longer belongs to her, a conclusion drawn by her superior Si and auxiliary, logical Te. But what happens next is is even more important: Temple runs out of the house into the ranch, jumping over the fence, through the cows, reaches the metal machine for cows, throws herself inside and cries. Her aunt arrives and asks her to get out, but Temple begs her to close the device and squeeze the two walls against each other. Hesitantly, the aunt follows her instructions. The result is that Temple completely calms down. At this point it is also quite clear that the aunt personifies the Trickster consciousness, for she is both the creator of this situation as well as the instrument of liberation. Through her aunt, Temple gets in touch with her feeling function, which from then on guides her, as she now values the squeezing machine tremendously. It is the only thing that calms her down; something she needed desperately due to her uniquely functioning sensory system. At the university, Temple builds her own squeezing machine and places it in her dorm room. Through her roommate, the rumors spread that Temple is using some weird machine, which soon prompts the school authorities to inquire into the matter. After interviewing Temple, the school psychologist concludes that the machine serves a perverse purpose of producing sexual pleasure and should be banned from use. This incident is reminiscent of the demonic, again, for the psychologist associates statements like “pleasure” and “makes me feel good” with sexual pleasure; such negative intuition, which von Franz correlates with “the capacity to smell a rat” (p. 42), undermines Temple’s actual intention which is the opposite of stimulation. Her eighth function, introverted intuition, connects to apprehension of inner truths; so Temple now has to overcome this new obstacle. Guided by Ni , she goes out at night to the trash can and attempts to remove the squeezing machine and bring it back to her room. The school’s police officer stops her; she runs away, hides in the bush and watches as the officer destroys her invention. She feels “desperately alone and hopeless when trying to find the significance or meaning” (McAlpine et al., 2009) of what is going on, again indicative of demonic Ni. The next scene shows Temple at the ranch again. Her aunt, when talking to Temple’s mother, conveys to her that her daughter won’t return to school after spring break if they don’t let her use her squeezing machine. The mother is concerned, for the school has clearly forbidden its use, but the aunt is able to convince her to allow them to try. At this point, the aunt seems to personify Temple’s tertiary Fi, for Temple is now aware of the importance of the squeezing machine in her ability to survive at the university and its excruciating sensory requirements. She has assimilated the feeling function so that she is ready to fight for the value it represents no matter what. At the university, Temple and her aunt attempt to convince the faculty to let her have her machine. The faculty objects by saying that it is not scientific (Ti in the 6th or Witch/Senex position), prompting Temple to activate her auxiliary Te, which is now partnered with her Fi in the Puella position with the aim of arguing her case. Temple asks the faculty to allow her to conduct an experiment and hence prove empirically that the squeezing machine has a scientific value, adding: “I can measure the heart rate!” (Ferguson, 2010). When observing that the faculty agreed, her introverted feeling gets “hooked with childlike enthusiasm and excitement” indicative of tertiary Fi (McAlpine et al, 2009). The squeezing machine became crucial to her success in her university studies, by enabling her to calm sensory hyperarousal that would otherwise cause her to withdraw and break down. Intuitions are “unborn possibilities, the germs of the future” and so is the “capacity for intuiting that which is not yet visible, future potentialities” (von Franz, 2013, p. 42). When the intuition is extraverted in attitude, these possibilities are triggered by the external world. “The inferior function is the ever-bleeding wound of the conscious personality, but through it the unconscious can always come in and so enlarge consciousness and bring forth a new attitude” (p. 72). The inferior function is carried by the archetypes of Anima/Animus as “archetypes of soul” that serve to represent “the otherness of the unconscious psyche” and are “allowing … a relationship to develop between the two parts of the mind … with the potential to replace this tension of opposites with the harmony of wholeness” (Beebe, 2005, p. 40). The way Temple is able to, through differentiation of her unconscious functions, come significantly closer to that “harmony of wholeness” is illustrated by a scene toward the end of the movie where she is at her graduation ceremony receiving her degree in animal science. An image unexpectedly captures her attention. Approaching closer, she realizes that it is some kind of wooden construction with stairs. Without giving it a second thought, Temple climbs the stairs in her mind. When she reaches the top, she enters inside the construction. Her face brightens with satisfaction. At this point the director does not capture any visual cues but focuses the camera merely on Temple’s face as she approaches something unknown with positive feelings. Assimilation of the inferior function implies “loosening the hold of the superior function” (Beebe, 2005, p. 41), hence the scene lacks concrete imagery, for Temple has become attuned to her intuiting function. As Temple reaches her destination up high inside the construction, the sun shines through the plastic windows, and it is seen that what had attracted Temple was a door, for she says, “This is my door. It takes me to another world” (Ferguson, 2010), confirming von Franz’s insight about the inferior function being “the door through which all the figures of the unconscious come into consciousness” (p. 72). Unsurprisingly, this door image also was a metaphor given to Temple by her favorite science teacher, intended to help her when she stumbled against seemingly unresolvable [sensory] situations. Temple’s superior Si favored concrete data that exist within immediate reach, whereas the inferior Ne is now inspired by extending its focus towards the future and as yet intangible possibilities. 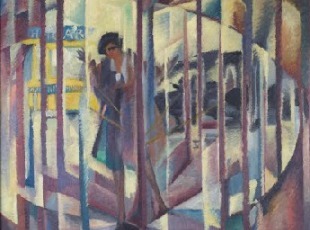 As she extends her hands to the windows and opens them, the director shows a scene of a cattle farm with numerous cows and relevant activities taking place. Initially sensory-based and ever concrete, Temple has now learned to envision her own future. Noteworthy is the interplay between the distinct sensory modalities (Dilts, Grinder, Bandler, & DeLozier, 1980) functioning under the general umbrella of the function of sensing and how these resemble some of the key ego-dystonic characteristics of the shadows of her superior as well as inferior functions as represented by the Opposing Personality function, extraverted sensation (Se), and the Demonic Ni. In her presentation titled “Exploring the Mind of a Visual Thinker: Thinking in Photo-Realistic Pictures,” Grandin (2007) referenced a crucial stage of her individuation, describing how she had to learn to relate the “picture in [her] mind to drawings” so as to “sense and relate in a concrete and practical way to outer objects” (von Franz, 2013, p. 33). This is the Se function, which for Temple falls in the 5th or Opposing Personality position, which she had to learn to assimilate—as for example, when she needed to be able to translate the mental visual image into a structural drawing of a cattle-handling system. This is an elegant example of a psychologically crucial process of “differentiation of a function,” which, though she initially “avoided” it (Beebe, 2004, pp. 105-7), she then had to “learn to assimilate.” This was a crucial milestone for the next stage of her personality development. She describes this learning process as an uneasy process, one that required deliberate effort. She learned to translate a visual image into the kinesthetic “representational system” (Dilts et al., 1980, p. 17). She needed to reconcile her impeding demonic Ni with the heroic determination of her dominant Si (i.e., the “image in my mind”) to achieve collaboration with the shadow and transform its impetus into the daimon’s blessing. Furthermore, her “good-parenting and evaluating auxiliary” (Beebe, 2005), Te, seems to have undergone a major development too: for she had to translate the complete picture of a perfectly working livestock handling system into an architectural drawing—an example of how extraverted thinking is “fed … from objective data transmitted by sense-perception” (Jung, 1971, CW 6, para. 577). According to Jung, introverted thinking, by contrast, when translating “the initial image into an idea adequately adapted to the facts” is “primarily oriented by the subjective factor” (paras. 628-629), which seems to validate this typological distinction within Temple’s psyche. She had to integrate the shadow of her auxiliary extraverted thinking function, namely the sixth function, Ti, which is carried by the archetype of Witch/Senex (Beebe, 2004). Temple’s victorious dedication to her psychic individuation is thought-provoking and inspirational. In the process of beginning to differentiate some of her unconscious functions, her “first four” functions “developed and became conscious function-attitudes” (cited in Shumate, 2009, p.1), allowing Temple’s creative expression to emerge. As the result of this enlivening dance of the consciousness between superior and inferior, auxiliary and tertiary functions with their counterparts in the unconscious shadow, she became a renowned scientist who designed three-fourths of the livestock facilities in the United Sates (Grandin, 1995/2006). It seems likely that an integration of biological and psychological theories, when inquiring about autism, could result in an alternative understanding of this condition. Investigating autism with the tool of personality types and seeing through the archetypal underpinnings of the function-attitudes of an autistic personality profile could expand the existing research paradigms. Such cross-disciplinary collaboration and recognition of the underlying psychological dynamics would also, inevitably, enrich the treatment intervention modalities and transform our understanding not only of the autistic psyche, but of the psyche in general. Beebe, J. (2004). Understanding consciousness through the theory of psychological types. In J. Cambray, and L. Carter (Eds. ), Analytical psychology: Contemporary perspectives in Jungian analysis (pp. 83-115). Beebe, J. (2005). Evolving the eight-function model. Association for Psychological Types Bulletin, Winter, 2005, 34-39. (Reprint 2006, Australian Psychological Type Review 8(1), 39-43. Beebe, J. (2006). Psychological types. In R. Papadopoulos (Ed. ), The handbook of Jungian psychology: Theory, practice, and applications (pp. 130-141). London, UK: Routledge. Dilts, R., Grinder, J., Bandler R., & DeLozier, J., (1980). Neuro-linguistic programming: The study of the structure of subjective experience. Capitola, CA: Meta Publications. Dunn, W. (2014). Sensory processing: Identifying patterns and designing support strategies. In K. Dunn Buron, & P. Wolfberg (Eds. ), Learners on the autism spectrum: Preparing highly qualified educators (pp. 137-8). Shawnee Mission: Autism Asperger Publishing Company. Ferguson, S. (Producer) & Jackson, M. (Director). (2010). Temple Grandin [Motion picture]. United States: HBO Films & Ruby Films. Frith, U. (1989/2003). Autism: Explaining the enigma. Malden, MA: Blackwell Publishing. Grandin, T. (1995/2006). Thinking in pictures. New York, NY: Vintage Books. Grandin, T. (2007, February). Exploring the mind of a visual thinker: thinking in photo-realistic pictures. Paper presented at the UC-Davis MIND Institute’s Distinguished Lecturer series, Davis, CA. Retrieved from http://www.ucdmc.ucdavis.edu/mindinstitute/videos/video_dls.html. Jung, C. G. (1971). General description of the types (R.F.C. Hull, Trans.). In H. Read et al. (Series Eds. ), The collected works of C.G. Jung (Vol. 6, pp. 330-407). Princeton, NJ: Princeton University Press. (Original work published in 1921). McAlpine, R., Shumate, C., Evers, A., & Hughey, D. (2009). The function-archetype decoder [Software program]. Louisville, KY: Type Resources. Minshew, N. J., Williams, D. L., (2014). Brain-behavior connections in autism. In K. Dunn Buron, & P. Wolfberg (Eds. ), Learners on the autism spectrum: Preparing highly qualified educators (pp. 63-73). Shawnee Mission: Autism Asperger Publishing Company. Shumate, C. (2008, 2009). “The opposing personality: Recognizing the archetypal energy,” Bulletin of Psychological Type, 31(4), 47-52 and 32(2), 36-41.
von Franz, M. L. & Hillman, J. (2013). Lectures on Jung’s typology. Dallas, TX: Spring Publications. Antonio de Guezala, “The Revolving Door” or “Portrait of Begoña de la Sota” (1927). Courtesy: Museo de Bellas Artes de Bilbão. 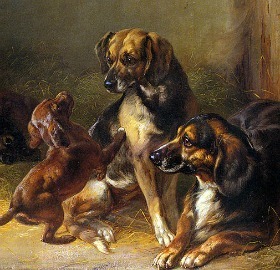 Benno Adam, “Dogs and Whelps” (1853). 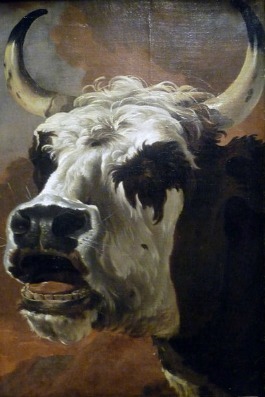 Jan Asselin, “Tête de bœuf” (Groningue) (c. 1647). 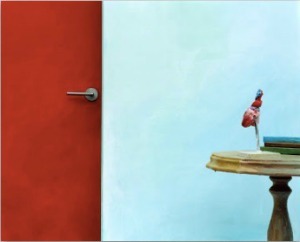 Hyun Mi Yoo, “Still Life—Red Door and Heart” (2007). Courtesy: Korean Art Museum Association. 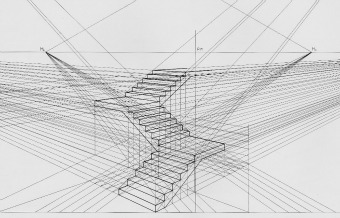 Luciano Testoni, “Staircase Perspective” (2009). 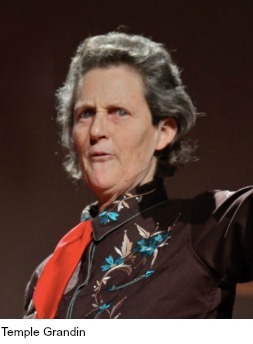 Photo by Steve Jurvetson, Temple Grandin delivering a TED talk (2010). This is fascinating. As an ISFJ, I’m aware of how my experience of the introverted sensation function has many things in common with what is often described as the experience of autistic people. The detail that surprised me in this article was about thinking in images rather than words. I’m going to have to examine my experience and see if I can relate to that or not. My first reaction is that it sounds unfamiliar to me. Wow. I’m blown away by your fascinating article. As a person with INTJ preferences, Si is somewhat of an alien concept to me, and I was awe-struck by the description of Grandin’s superpower. I can’t help but wonder if there are also individuals who have other equally pronounced preferred processes. What would it be like to have the exaggerated power of Fe, or Ni, or…? Thank you! “Thinking in images” is a common characteristic in individuals with autism. Neuroscientific findings have shown in many cases that there’s a great difference in the autistic brain. In many cases the visual cortex is unusually bigger than the other regions as well as in relation to the visual cortex of neurotypical individuals. fMRI scans have shown that in such cases the visual cortex exhibits too much activity, suggesting that many individuals with autism perceive and process information primarily through this region. The amount of the white matter in this region has also shown abnormalities in that the neurons that travel long distances consist of very little myelin (component of white matter, which increase the speed of impulses), whereas those that travel short distances have much more than needed. Thank you so much for your comment! Very interesting thoughts, indeed. It would be interesting to read about such cases. Autism, implying a very real and ‘different’ neurological wiring allows such reading of a case. I would assume that exaggerated Fe would entail, for example, a woman who has a child with a disability and who is identified with her mothering role, carrying out the functions of Fe. In my observation, those women who represent collectivist cultures especially have the tendency to demonstrate heightened degree of Fe expression. I have encountered mothers who are almost completely consumed by the mother archetype, hence, are unable to generate any other way of being. Their lives entirely revolve around fighting for the needs and rights of their disabled child. It would be interesting to conduct a “typological investigation” in this area and compare/contrast mothers who have succeeded in the development of other functions and those that have not. 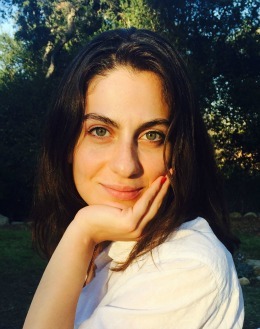 Hasmik Israelyan, M.A., was born in Armenia where she studied piano at Tchaikovsky Professional Music School. After moving to the U.S., she studied psychology and worked as a behavioral therapist and consultant for families of children with developmental disabilities. She became a Master Practitioner of Neuro-Linguistic Programming at UC-Santa Cruz, studied autism at UC-Davis, and Applied Behavior Analysis at the Florida Institute of Technology. She is now working on her doctorate in Depth Psychology at Pacifica Graduate Institute.